On January the 30th, 2019, Update 4.2.0 was released! On top of getting stuff like the ability to test out your own arena defense, we also got two new monsters – the Sniper Mk. Is and the Cannon Girls! Today, we’re going to be looking at the second of the new families: the Cannon Girls! This is going to be a two-part article; the previous covered my first looks on the Snipers. We’ll start with the fire Cannon Girl, Scarlett. Fun fact: did you know that if I ever got a dupe Charlotte, I would name her Scarlett? Fire! : Attacks the enemy 3 times. Each attack has a 30% chance to decrease the Attack Bar by 30%. Oh, this is like Loren’s first skill, except the passive of the attack bar decrease is built in. Seems pretty decent. Wild Shot! : Attacks random enemies 8 times. Each attack has a 50% chance to weaken their Defense for 2 turns. (Reusable in 4 turns) …Wow. That’s a lotta hits, especially for a second skill. Can you imagine using any of the Wild Shot Cannon Girls in NB10? They’d be, like, the perfect shield breakers! A Cannon Girl plus a pair of twins sounds really OP. Fatal Mortar Bullet (Awakened): Attacks the enemy with a cannon gun and destroys the target’s MAX HP by 50% of the inflicted damage. Afterwards, inflicts damage on all enemies and blocks beneficial effects for 1 turn with a 50% chance each. (Reusable in 5 turns) Oooooh! This third skill seems pretty good. HP destroy is fun, and an AoE buff block that isn’t just a buff block skill (like Nisha) is always nice. Granted, I can see Scarlett being the weakest of the “Fatal XYZ Bullet” Cannon Girls, sadly, but she still does look really good. Fire! : Attacks the enemy 3 times. Each attack has a 30% chance to decrease the Attack Bar by 30%. Same first skill. Wild Shot! : Attacks random enemies 8 times. Each attack has a 50% chance to weaken their Defense for 2 turns. (Reusable in 4 turns) Also the same second skill. Fatal Extinctive Bullet (Awakened): Attacks the enemy with a cannon gun and removes all beneficial effects granted on the target. Afterwards, inflicts damage on all enemies and decreases their Attack Bar by 50%. (Reusable in 5 turns) Oooh! 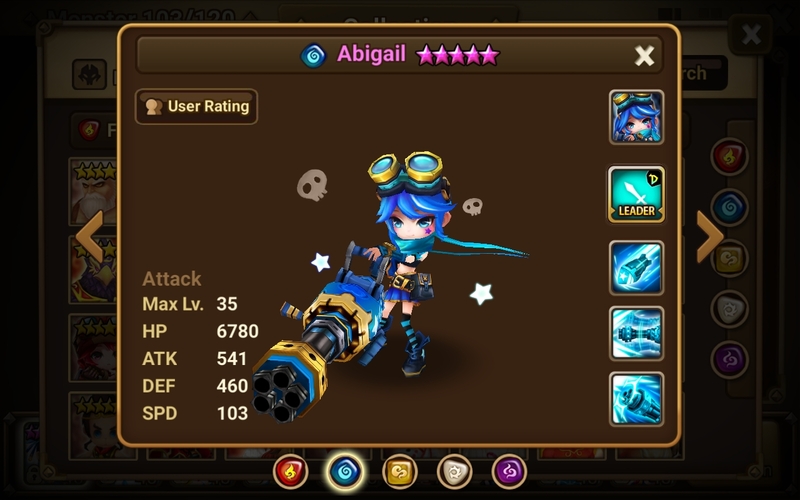 Abigail looks like she could be used in, say, DB10. I mean, she’s water element, got the buff removal, plus she has 50% Attack Bar decrease on this skill alone. I dunno how well Wild Shot would work out with the boss and his crystals, though. The Cannon Girls are the first family to have an elemental nat5 in the family of nat4s! There are two nat5s in this normally nat4 family – wind and dark. Christina is the wind nat5. Fire! : Attacks the enemy 3 times. Each attack has a 30% chance to decrease the Attack Bar by 30%. Same first skill, move along. Coy Revenge (Passive): Increases the damage to be dealt to an enemy on the next turn by 15% each time you’re attacked. This effect accumulates up to 5 times and resets whenever you’re turn ends. [Automatic Effect] Okay, here’s the main gimmick of the nat5 cannon girls. They have a passive, but they also have a fourth skill as well. This is Christina’s passive. It’s kind of like the dark Frankenstein Crawler’s passive, except there’s a hard limit on how many times the damage can increase. Rolling Cannon (Awakened): Attacks all enemies with a cannon gun. The damage increases in proportion to the number of allies alive and Attack Power of all allies. (Reusable in 5 turns) Rolling Cannon actually sounds pretty good! I mean, its damage raises in proportion to the attack power of all allies, and the allies alive. I’m not sure what it means by the attack power part (like Christina’s attack + the power of all allies combined or the highest attack power in the room), but wow! That’s pretty good! Fire! : Attacks the enemy 3 times. Each attack has a 30% chance to decrease the Attack Bar by 30%. Same. Wild Shot! : Attacks random enemies 8 times. Each attack has a 50% chance to weaken their Defense for 2 turns. (Reusable in 4 turns) Saaaaaaame. Fatal Armor Bullet (Awakened): Attacks the enemy with a cannon gun and decreases the Attack Bar to 0. Afterwards, inflicts damage on all enemies and stuns them for 1 turn with a 30% chance. (Reusable in 5 turns) Oooooh! Emily seems like the best of the four-stars. I mean, attack bar reduction, and an AoE stun. Granted, the stun chance is kind of low and all, but still, she could be a good ToA mon. And now, we’ll end this article with Bella, the light Inugami – I mean, the dark Cannon Girl. Fire! : Attacks the enemy 3 times. Each attack has a 30% chance to decrease the Attack Bar by 30%. The same first skill. Focused 5 Shots: Attacks the enemy 5 times. Each attack has a 50% chance to inflict continuous damage for 1 turn. (Reusable in 4 turns) The same second skill. One More Time! (Passive): If an enemy is defeated with your skill, you will attack another enemy once again with the same skill. This effect is activated only once on your turn. [Automatic Effect] Oh, this is a nice passive! It’s like a built-in Vio proc. Sadly, the effect is only activated once per turn, so you can’t go on a killing spree or anything, just like with Isabelle and Endless Death. Burst Cannon (Awakened): Attacks the enemy with a cannon gun and destroys the target’s MAX HP by 100% of the inflicted damage. (Reusable in 5 turns) Okay, this skill may be what triggers her passive a lot! I mean, there’s some MASSIVE damage to be had here. I checked her multipliers, too, and the multiplier for this skill is 800%! Overall, Bella is great; I’d say she’s the best of the Cannon Girls. Anyway, that’s it for this article. The Cannon Girls are REALLY good; better than the Snipers, in fact. I’m Sara Ann, and I’ll see you in the next article! Review: Summoner’s War Funko Pops!